Religious event volunteering is a contemporary form of religious tourism that has interest for both scholars and practitioners: for the former, it is a social behavior that can be analyzed through many disciplines, consumer behavior being the one chosen here; for the latter, religious events do contribute to destinations development, although their impact is difficult to measure. This chapter explores (conceptually) the common origins of religion and volunteering and reviews briefly the event marketing to better understand the second part, which (empirically) reflects the results of two surveys undertaken with volunteers in two Catholic mega-events held in Spain. Findings show appropriateness of the consumer value-based approach as a trade-off between benefits (efficiency, social value, entertainment, and spirituality) and effort (time and effort spent) outcomes of volunteering. These value dimensions are also embedded in a chain of effects value-satisfaction-loyalty (as likelihood of repeating or/and recommending). Guidelines for organizations dealing with religious events as a form of religious tourism are offered. Religious Tourism is one of the oldest modalities of tourism (Jacobsy & Smith, 1992), pilgrimage being one of its clearest expressions (Raj & Morpeth, 2007; Timothy & Olsen, 2006). Religious tourism is also a contemporary global phenomenon: in the last decade, the UNWTO estimates that 300 to 330 million tourists were visiting the world´s key religious sites every year, with approximately 600 million national and international religious voyages worldwide, 40% of which take place in Europe (UNWTO, 2014). As an anthropological behavior, Religious Tourism is constantly revisited by scholars, and offers contemporary insights for a modern understanding of what tourism is and means. Moreover, diachronically and synchronically speaking, the relevance of pilgrimage is crucial in the origins of touristic movements across cultures (Turner, 1973) and it is also prevalent across the history of tourism (Feifer, 1986). However, this relevance of pilgrimage may have overlapped other forms of Religious Tourism, such as Religious Events, that are present scholar, social and economic interests. Indeed, Religious Events are a contemporary form of Religious Tourism that has interest for both scholars and practitioners. UNWTO calls them Religious Festivals by UNWTO, for all faiths and traditions. Their potential for the tourism sector is high: as UNWTO asserts “they are capable of attracting hundreds of thousands or even millions of participants, tourists, residents and pilgrims; they are different from pilgrimages and are held to mark an event, or on the occasion of the visit of an important religious figure, an anniversary or a jubilee. Most of the time they are just as festive as they are religious in character, especially in the case of youth oriented gatherings” (UNWTO, 2015, p.4). However, in spite of this richness, the UNWTO also claims that there is not reliable data regarding the volume, the dynamics and the characteristics of Religious Events, concluding that the only certain thing is that their organization is generally complex (UNWTO, 2015). Likewise, the ARC (Alliance of Religions and Conservations) highlights the failure to get fully accurate figures for the number of pilgrims to most sites and events as records are not kept (ARC, 2014). 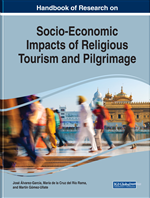 Moreover, for the case of Spain, the scope of our study, Canovas and Blanco (2011, p. 128) confirm the difficulty of obtaining data on religious tourism although they predict its promising future as cultural tourism. Consequently, Religious Events are a topic to be further developed, measured and researched by Universities. In fact, scholars from many disciplines can approach (Religious) Events, because studying human behavior related to events is multifaceted (Crompton and McKay, 1997). The discipline chosen here is Marketing and specifically, Consumer Behavior, and among the many stakeholders involved in (Religious) Events (Hall, 1992; Getz, 1997; Ritchie, 1984), the focus is on Volunteers. As stated in Gallarza et al. (2013), “volunteers are one of the key factors in the success of most events”, but they are also neglected as they are somehow a “hidden workforce” (Kemp, 2002, p. 109), because on the top of being “silent” they take the “hard work” (Goeldner, Ritchie and McIntosh, 2000, p. 235). Volunteers in Events deserve therefore more attention, and more precisely, Volunteers in Religious Events, as Religious Events are the less preferred focus of study by scholars in comparison to Cultural Events and Sport Events (Fayos et al., 2014; Gallarza et al., 2016). Volunteer: A person who performs an unpaid activity, within a formal structure, and involving some type of time commitment. Religious Event Volunteer: A volunteer involved in Religious Events that normally shows a higher altruistic or religious motivation. Loyalty: Customer loyalty in tourism is driven by the commitment shown after a tourism experience towards the service provider. It can be behavioural (intention to return) or attitudinal (intention to recommend) or both. Event Tourism: Corresponds to the design, development and marketing of planned events as tourist attractions. Perceived Value: Or consumer value or service value or customer value, is the consumer overall assessment of the utility of the consumption experience in term of the difference between what is received and what is given. Event: The systematic planning, development and marketing of planned events as tourist attractions, which have benefits to place marketing and image-making. Religious Events: Scheduled religious happenings, commonly celebrated on recurring cycles with large audiences of attendees and volunteers involved in the organization.